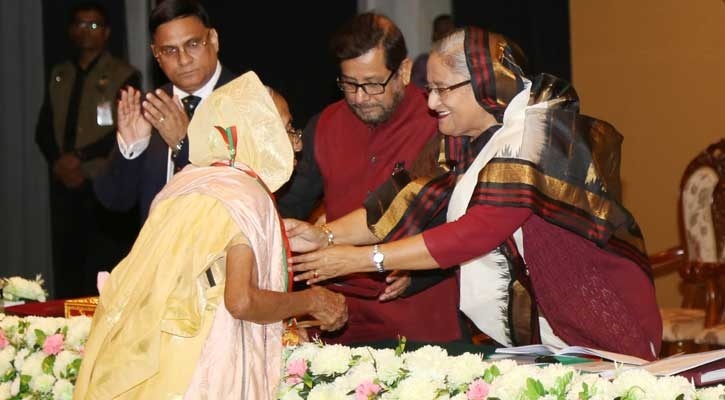 Prime Minister Sheikh Hasina has conferred the prestigious ‘Ekushey Padak-2019’ to the recipients for their outstanding contributions to their respective fields on Wednesday. 21 eminent persons selected for the second highest civilian award of the country this year. The premier distributed the Ekushey Padak at a ceremony at the Bangabandhu International Conference Centre on this afternoon. State Minister for Cultural Affairs KM Khalid chaired the function organised by the Ministry of Cultural Affairs. Acting Secretary of the ministry Dr Abu Hena Mostafa Kamal delivered the welcome address, while Cabinet Secretary Mohammad Shafiul Alam conducted the award-giving part of the function and read out the citations of the awardees. Cabinet members, the PM’s advisors, judges, parliament members, foreign diplomats, litterateurs, poets, academics, writers, poets, journalists, Ekushey Award laureates of previous years and high civil and military officials attended the function. This year’s winners of the award are: Late Prof Halima Khatun (posthumous), Advocate Golam Arif Tipu and Prof Monwara Islam for Language Movement; Subir Nandi, late Azam Khan (posthumous) and Khairul Anam Shakil for music; Lucky Inam, Suborna Mostafa and Liakat Ali Lucky for acting; Sayeda Khanam for arts; Jamal Uddin Ahmed for fine arts; Khitindra Chandra Bioshya for Liberation War; Dr Biswajit Ghosh and Dr Mahbubul Haque for research; Dr Pronab Kumar Barua for education; and Rizia Rahman, Imdadul Haque Milon, Asim Saha, Anwara Syed Haque, Mainul Ahsan Saber and Hori Shankor Joldas for language and literature. The Cultural Affairs Ministry announced the names of the recipients on February 6. The ‘Ekushey Award’ has been introduced in memory of the martyrs of the Bengali Language Movement of 1952. The award is given to recognize contributions to a number of fields, including culture, education, and economics. Each recipient gets a gold medal, a certificate and a cheque for Taka 2 lakh.